Twin mattress is the smallest in width and length with actual dimensions 39 x 75 inches or 99.1 x 190.5 centimeters. The total area of a mattress is 2925 square inches or 18,878 square centimeters. It is the best option for one person in small bedrooms. Located in the middle of a room twin bed will allow about 40 inches of space from both sides and 45 inches from longer bed side to bedroom wall in 10 x 10 feet bedroom. It will perfectly accommodate two nightstands and up to 27 inches deep dresser. Placed in the corner twin bed open up bigger area and bigger dimensions drawers might be easily incorporated in to room design if bedroom layout is suitable. Twin size bed will consume a little bit more than 20% of a total 10” x 10” bedroom area living plenty of space for other bedroom furniture. In bigger bedrooms it is even possible to put two twin beds for teenagers or guest. 39” x 75” is a typical mattress measurements and actual bed size usually slightly bigger adding a few extra inches from all four sides depending on a bed type. Twin mattress sizes also refer as a single mattress dimensions with the same width as an extra-long twin mattress but 5 inches shorter. Usually twin size mattress is a best option for one child or for a single mature person with an average or shorter than average height. For a higher and overall bigger people in might be better to consider more roomy and spacious options. Also it is definitely a good choice for a room with a lack of a space. The thinness of a twin mattress will vary from 5” to 18” or even more depending on a type and brand and total heights with a foundation will range from 9 to 25 inches or from 23 to 64 centimeters. Twin mattress will be lighter from all because of its size comparably smaller to any other option. 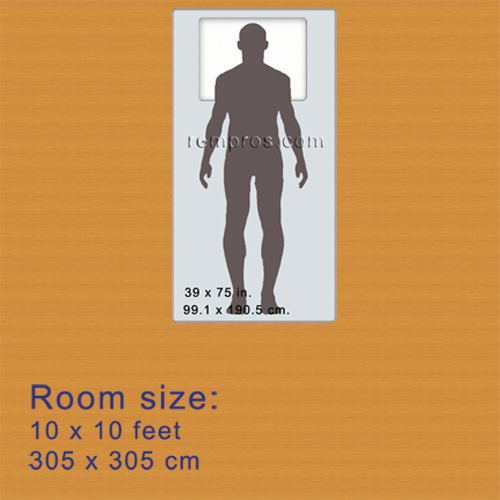 Dimensions of twin size mattress were proportionally resized according to average men heights - 5 feet 10 inches (1.778 meter) and 10 x 10 feet (305 x 305 centimeters) bedroom.